Really enjoyed, Julia our guide was very witty and kept us engaged throughout. Underground and stage visit was by far worth the extra. Be prepared for lots of walking! We had a fantastic time with Vincenzo our tour guide. We started with a small group that was combined with another small group to see the underground. Because it rained we were not able to see the underground part of the Colosseum. We then toured the Colosseum and Forum. Vincenzo was very knowledgeable about the area. I appreciated the insight he gave to the sight. This tour takes you places others don't. The underground complex of the Colosseum is a must see. You will appreciate the genius of the engineers who designed the ancient world's greatest theater complex. Hint: Watch Russell Crowe in "Gladiator" before you go and you'll be able to fully visualize the mechanics of the underground architecture. This tour gave me history and learned a lot from it. On top of it, our tour guide mixed it with humorto make it entertaining. The ruins of the Roman Forum and treading along the cobblestone path of the Palatine Hill made me think of the movies I used to watch, but now, I was actually on it. Incredible feeling while cruising the ancient path of the Roman Empire. This guided tour for 4 hours which also included the Forum, was so well worth the cost! Don’t think twice... do it! You can’t go wrong with this tour. Julia was a wonderful guide. Lots of interesting information and fascinating facts. In addition we saw the Roman Forum and Imperial Palace. It was an excellent tour with excellent and very knowledgeable guides who spoke perfect English.We had two different guides, one for the top of the Colosseum and the other one for the inner/lower part. It broke up the tour a little because my kids (8 and 12 years old) started getting a little restless. While we were in the top part of the Colosseum there was also a third person who ensured nobody got left behind. All of us had our individual headset to hear our guide speak which was perfect! AWESOME!!! Was able to view the Colosseum main level and the underground. Seeing the underground tunnels and the areas where the animals and gladiators were housed was amazing. Gives you a new perspective on how things were back then. 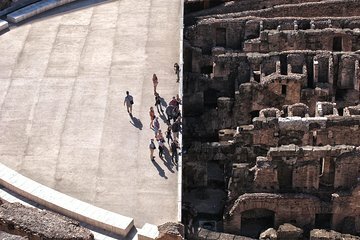 The Coloseum is a masterpiece and I highly recommend that you do the underground tour! This tour was a little long for the teens in our group. We toured the Forum first and the teens were bored waiting for the underground. It was worth the wait. Great tour lots of history. Our guide was great. I would recommend this tour. Our family of 4, including 2 teenagers took this tour and it was amazing! Our tour guide, Francesca was so informative and very funny. She went out of her way to take care of us during the tour and even after by suggesting good restaurants to try near where the tour ended. Seeing the underground of the Colosseum was so incredible, it was worth the extra money to get that experience.